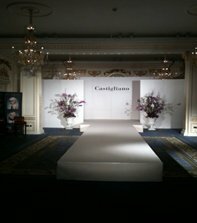 Staging Hire UK have a wide selection of catwalks and catwalk stages for hire in the UK and Europe. The first type of catwalk is the traditional style stage deck system these can be plain black as a wooden top. However included in the price is a carpet finish colour of your choice. Nine out of ten times the catwalk is carpeted white; we can also carpet or pinch pleat the sides so the whole catwalk matches. The more modern catwalks are being done in our pearl decks which are white. The fantastic thing about these decks is that they allow light to travel through them giving you the chance to really create some amazing colours and atmosphere with the latest in led lighting technology. All our stage systems are available in 500mm increments in the length and width. The height is available in 200mm increments. We do also stock quadrant sections to our stages to make curved fronted stages and catwalks we even stock Triangular sections so we can now build almost any shape of stage or catwalk. There are many other things that you may require for your catwalk event such as back drops, Draping, Sound Systems, and Lighting Systems and of course plasma and projection screens etc. We hold all of this equipment in stock please call for further information. 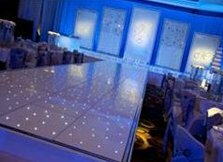 Another popular catwalk style is to have our white or black led floors laid on top of it so that the whole floor twinkles while the models are walking up the straight. Now also available is our colour commander floor which is also available for the surface of our catwalks or your own. This floor is a gloss black surface with LED�s which can make patterns and low resolution images. Staging Hire UK can deliver and install your stage or stage system anywhere in the UK including all the major cities. 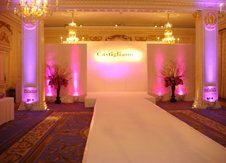 Contact us today at Staging Hire UK for further information on our catwalk hire services.